The Puckle gun (also known as the Defence gun) was a primitive crew-served, manually-operated flintlock revolver patented in 1718 by James Puckle (1667–1724) a British inventor, lawyer and writer. It was one of the earliest weapons to be referred to as a "machine gun", being called such in a 1722 shipping manifest, though its operation does not match the modern use of the term. 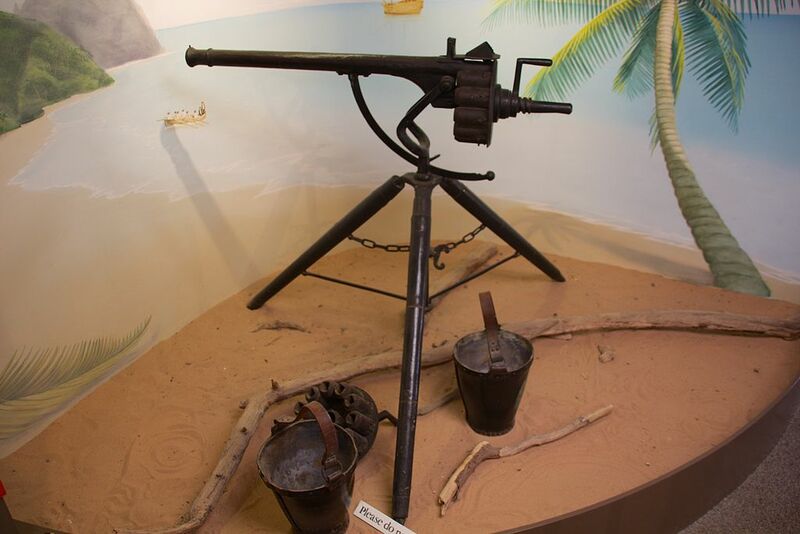 However, the Puckle gun was never used during any combat operation or war. Production was highly limited and may have been as few as two guns. The Puckle gun is a tripod-mounted, single-barreled flintlock weapon fitted with a manually operated revolving cylinder; Puckle advertised its main application as an anti-boarding gun for use on ships. The barrel was 3 feet (0.91 m) long with a bore of 1.25 inches (32 mm). 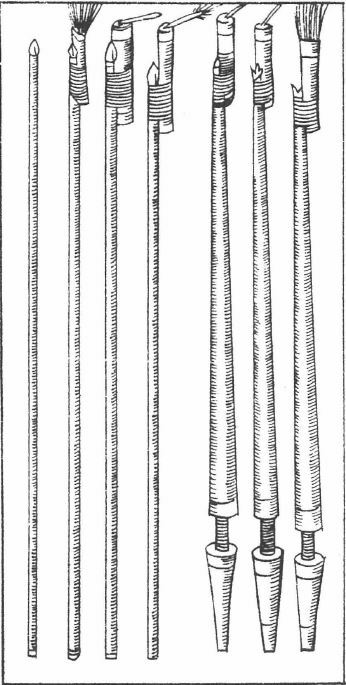 The cylinder held 6 to 11 shots depending on configuration, and was hand-loaded with powder and shot while detached from the weapon. According to the Patent Office of the United Kingdom, "In the reign of Queen Anne, the law officers of the Crown established as a condition of grant that 'the patentee must by an instrument in writing describe and ascertain the nature of the invention and the manner in which it is to be performed.'" This gun's patent, number 418 of 1718, was one of the first to provide such a description. T.W. Lee remarked, however, that "James Puckle's patent in 1718 contains more rhetorical fervor than technical rigor." Puckle demonstrated two configurations of the basic design: one, intended for use against Christian enemies, fired conventional round bullets, while the second, designed to be used against the Muslim Turks, fired square bullets. The square bullets were considered to be more damaging. They would, according to the patent, "convince the Turks of the benefits of Christian civilization". The weapon was also reported as able to fire shot, with each discharge containing sixteen musket balls. The Puckle gun was fired in a similar fashion to a conventional flintlock musket; however, after each shot, a crank on the threaded shaft at the rear would be unscrewed to release the cylinder to turn freely. The cylinder would then be advanced by hand to the next chamber, and the crank turned back again to lock the cylinder into the breech of the fixed barrel. The flintlock mechanism could then be primed for another shot: it was triggered using a lever which was separate from the crank assembly. To reload the weapon, the crank handle could be unscrewed completely to remove the cylinder, which could then be replaced with a fresh one. In this way it was similar to earlier breech-loading swivel guns with a detachable chamber which could be loaded prior to use. The cylinder appears to have been referred to as a "charger" in contemporary documentation. use with round and square bullets. 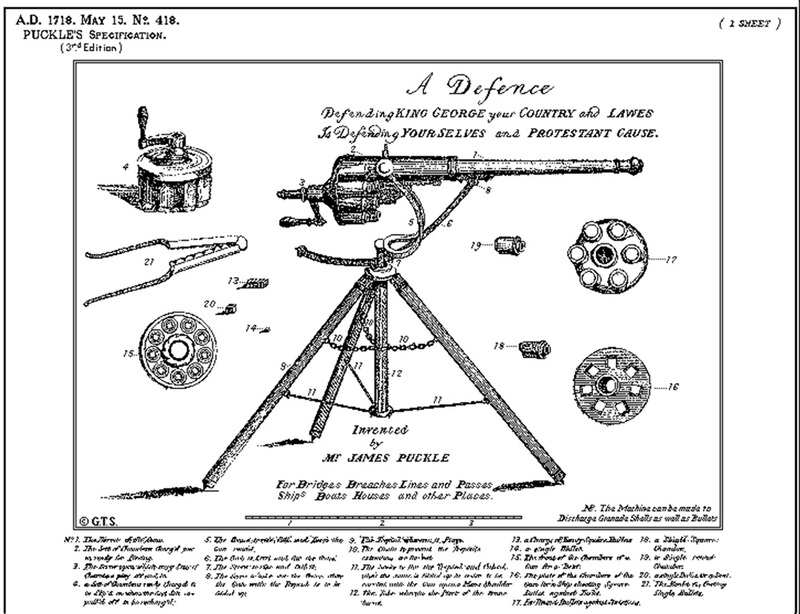 patented in 1718 the Puckle gun. A prototype was shown in 1717 to the English Board of Ordnance, who were not impressed. At a later public trial held in 1722, a Puckle gun was able to fire 63 shots in seven minutes (approx 9 rounds per minute) in the midst of a driving rain storm. A rate of 9 rounds per minute compared favourably to musketeers of the period, who could be expected to fire between 2 and 5 rounds per minute depending on the quality of the troops, with experienced troops expected to reliably manage 3 rounds a minute under fair conditions; it was however inferior in fire rate to earlier repeating weapons such as the Kalthoff repeater which fired up to six times faster. The Puckle gun drew few investors and never achieved mass production or sales to the British armed forces. As with other designs of the time it was hampered by "clumsy and undependable flintlock ignition" and other mechanical problems. A leaflet of the period sarcastically observed of the venture that "they're only wounded who hold shares therein". Production was highly limited and may have been as few as just two guns, one a crude prototype made of iron, the other a finished weapon made from brass. 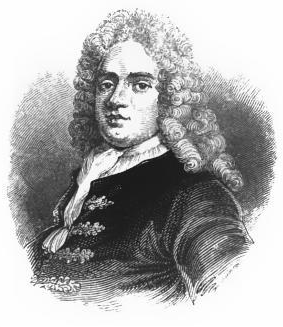 John Montagu, 2nd Duke of Montagu, Master-General of the Ordnance (1740-1749), purchased two guns for an ill-fated expedition in 1722 to capture St Lucia and St Vincent. While shipping manifests state "2 Machine Guns of Puckles" were among the cargo that departed from Portsmouth, there is no evidence that the guns were ever used in battle. Two original examples are on display at former Montagu homes: one at Boughton House and another at Beaulieu Palace. There is a replica of a Puckle gun at Bucklers Hard Maritime Museum in Hampshire. Blackmore's British Military Firearms 1650–1850 lists "Puckle’s brass gun in the Tower of London" as illustration 77, though this appears to have been a gun belonging to the former Montagu estate (at that point owned by the Buccleuch family) on loan to the Tower at the time. Elisha Collier invented a flintlock revolver in 1814, nearly a hundred years after the Puckle gun (though examples of flintlock and matchlock revolvers exist much earlier, with the earliest known dating back to the 15th century). Unlike the Puckle, the cylinder of the Collier was not interchangeable, slowing reloading, but would have had a faster rate of fire for its five chambers due to the integral cylinder advancing of its single-action revolver mechanism, self-priming mechanism, and the lack of a need to screw and unscrew the cylinder between shots. During the period between the widespread adoption of the revolver, but prior to widespread use of cartridges, a common method of increasing reload speed was to replace a revolver's entire cylinder with another pre-loaded one, similar to the Puckle gun. This practice was primarily done on Remington revolvers, as their cylinders were easily removable and were held by a cylinder pin, unlike the early Colt revolvers which were held together by a wedge that went through the cylinder pin. A single example of a 2-inch bore, five-shot revolver cannon was built and used by the Confederate States of America during the Siege of Petersburg. It was captured on 27 April 1865 by Union troops and sent for examination to the United States Military Academy at West Point, New York.. Article and photo of a rebuilt Puckle Gun. Gun was rebuilt from two original guns and spare parts. 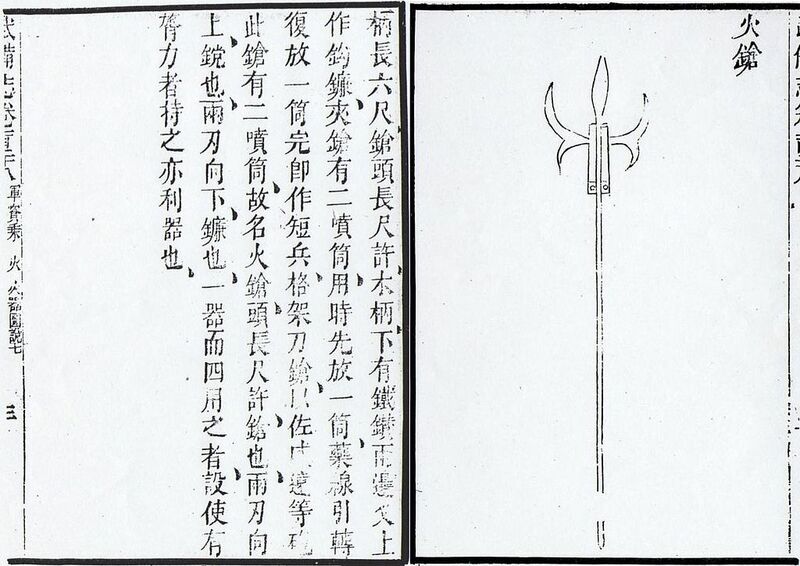 The fire lance (simplified Chinese: ?? ; traditional Chinese: ?? ; pinyin: hu? 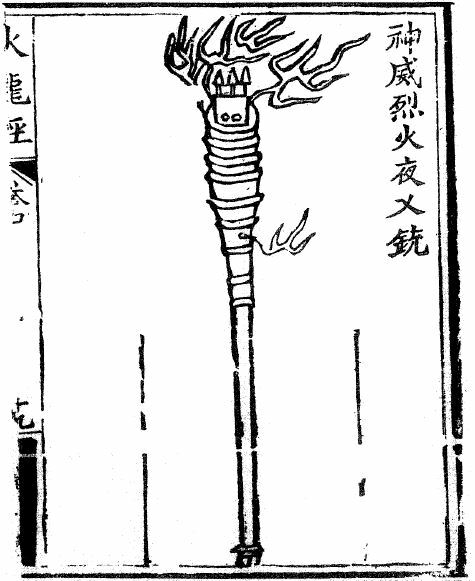 qi?ng) was a very early gunpowder weapon that appeared in 10th century China during the Jin-Song Wars. It began as a small pyrotechnic device attached to a spear-like weapon, used to gain a critical shock advantage right at the start of a melee. As gunpowder improved, the explosive discharge was increased, and debris or pellets added, giving it some of the effects of a combination modern flamethrower and shotgun, but with a very short range (3 meters or less), and only one shot (some were designed for two shots). In later larger and more powerful fire lances, the lance-point was discarded, as these versions were too unwieldy to be used in melee. These are considered to be a proto-gun, the predecessor of the hand cannon, and the ancestor of all firearms. 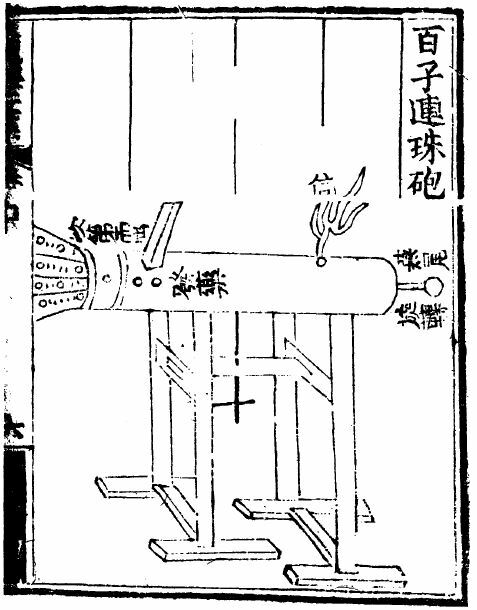 Fire lances that were too large for a single man to wield were emplaced upon the ground in a supporting framework; these can be considered a proto-cannon. 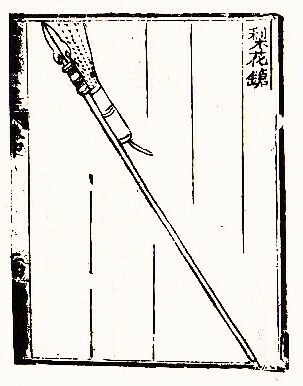 The first fire lances consisted of a tube, usually bamboo, containing gunpowder and a slow match, strapped to a spear or other polearm weapon. 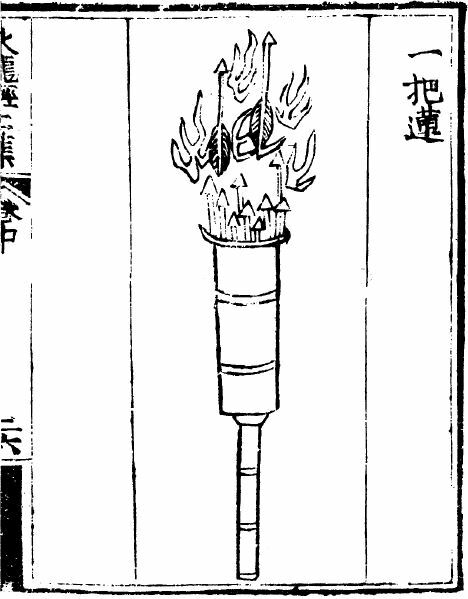 Once ignited, the gunpowder tube would ideally eject a stream of flames in the direction of the spearhead. 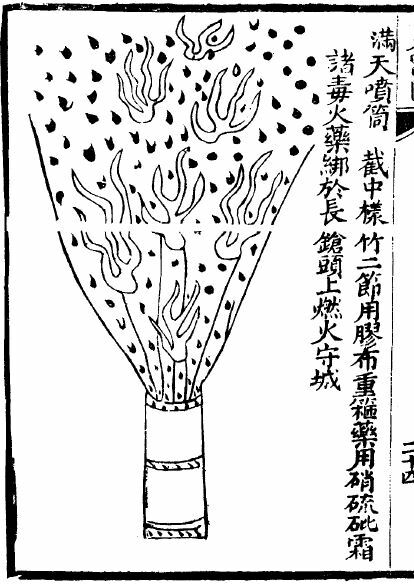 Co-viative projectiles such as iron pellets or pottery shards were later added to the gunpowder. 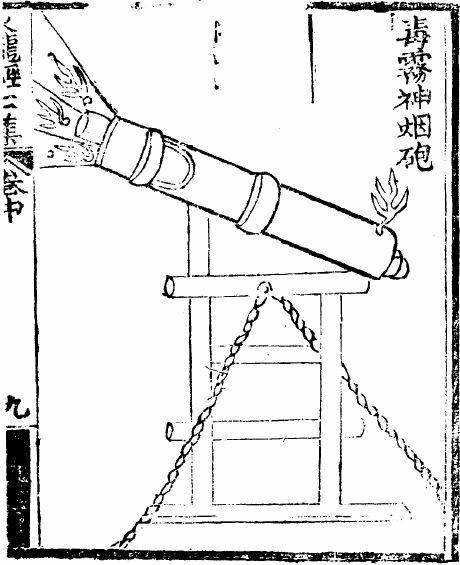 Upon firing, the gunpowder charge ejected the projectiles along with the flame. Metal fire lance barrels appeared around the mid 13th century and these began to be used independently of the lance itself. The independent metal barrel was known as an 'eruptor' and became the forerunner of the hand cannon. 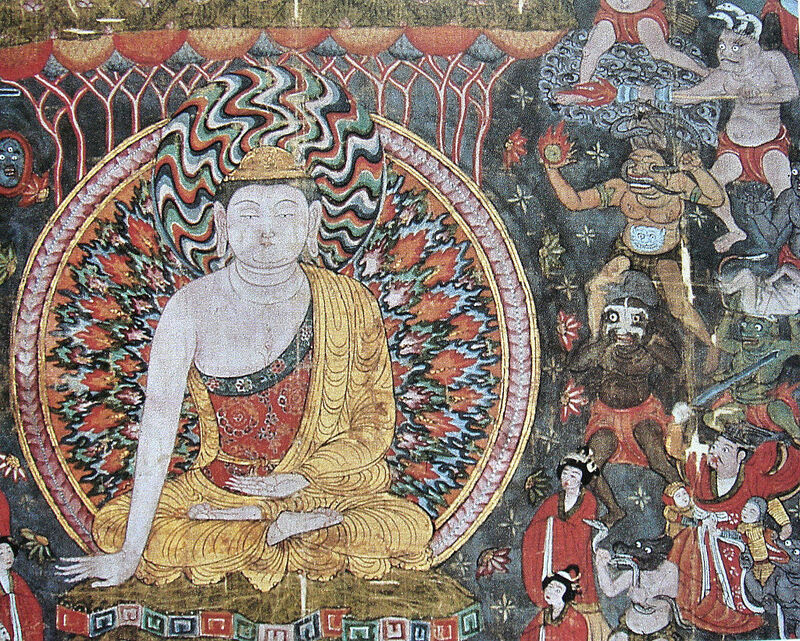 The first evidence of fire lances appeared in China in the year 950 and fire lances were also mentioned in the military text Wujing Zongyao of 1044. 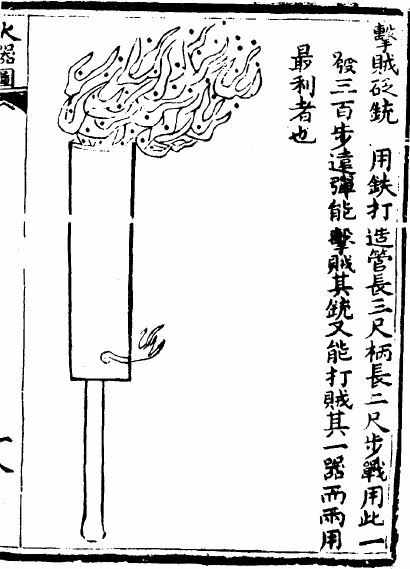 However usage of fire lances in warfare was not mentioned until 1132 when Song garrisons used them during the Siege of De'an, in modern-day Anlu, Hubei, when fire lance troops led the vanguard in a sortie against the Jin dynasty (1115–1234). In 1163 fire lances were attached to war carts known as "at-your-desire-carts" used to defend mobile firebomb trebuchets. In the late 1100s pieces of shrapnel such as porcelain shards and small iron pellets were added to the gunpowder tube. At some point fire lances discarded the spearhead altogether and relied solely on their firepower. A knight wielding a fire lance ca. 1396.
front of the lance more than ten feet, and when the gunpowder is depleted, the tube isn't destroy. In 1259 a pellet wad that occluded the barrel was recorded to have been used as a fire lance projectile, making it the first recorded bullet in history. By 1276 fire lances had transitioned to metal barrels. 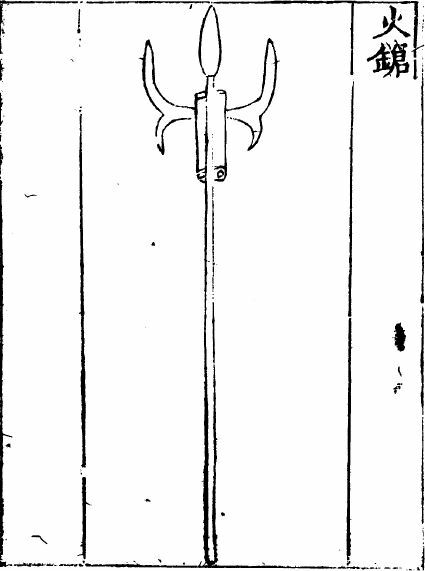 The metal-barreled fire lance began to be used independently of the lance around the mid to late 13th century. These proto-cannons which fired co-viative projectiles, known as 'eruptors,' were the forerunners of the hand cannon. By 1280 the Middle East had acquired fire lances. 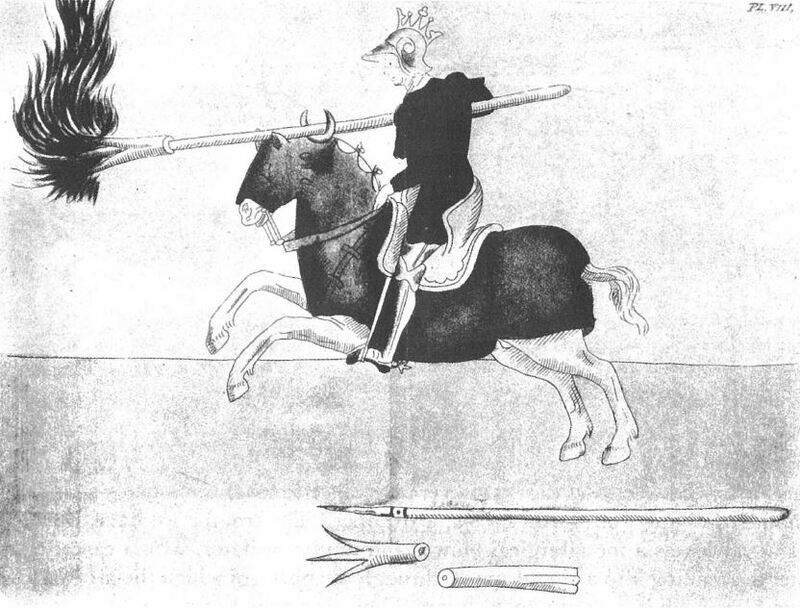 In 1396 European knights took up fire lances as mounted weapons. 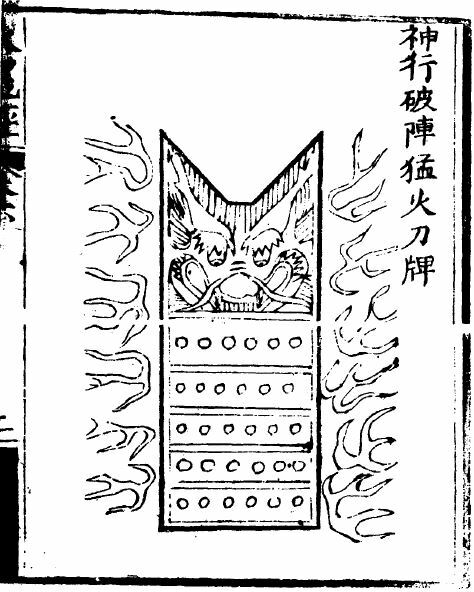 The last recorded usage of fire lances in Europe occurred during the Storming of Bristol in 1643.
as depicted in the Huolongjing. used to break enemy formations. All articles submitted to the "Brimstone Gazette" are the property of the author, used with their expressed permission. The Brimstone Pistoleros are not responsible for any accidents which may occur from use of loading data, firearms information, or recommendations published on the Brimstone Pistoleros web site.